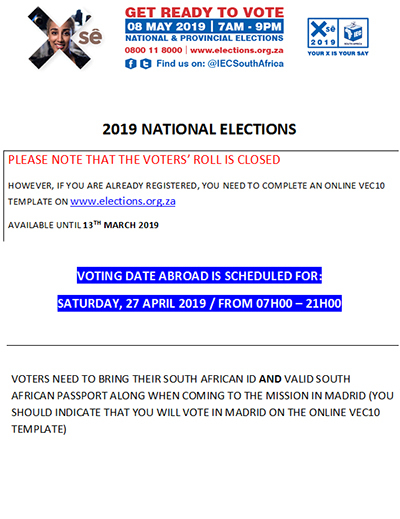 It gives me great pleasure to welcome you to the Website of the South African Embassy in Madrid. For those of you who are looking for useful information on South Africa we have endeavoured to supply you with some of the most relevant links which hopefully will provide the answers that you are looking for whether they are of a political, economic or social nature. For those of you who don’t know South Africa at all, I would like to welcome you to browse through our website and I trust that you will find this journey of great interest. For our Spanish visitors to this site, you will remember that South Africa successfully hosted the 2010 FIFA World Cup where your national senior men’s football team, “La Roja” won for the first time th e prestigious FIFA Trophy. South African Tourism’s 126 m2 stand at this year’s edition of the FITUR Tourism Trade Fair (23 January to 27 January 2019) was located in a prominent position within the pavilion and was jointly managed by South African Tourism and the South African Mission in Madrid. The stand included 9 South African exhibitors (three of which are SMMEs sponsored by the DoT’s TIP scheme) and a South African Tourism (SAT) desk. The nine South African companies were present on the stand: 3Sixty Luxury Marketing, Akilanga, Rhythm Africa Tours, Thompsons Africa, Akilanga DMC & Events, More & More Africa DMC, Catalina Tours, Nyanya Resort (TIP), Cape Town Destination Management Company (TIP) and Sky Villa Boutique Hotel (TIP). On 18 July 2018, in honour of the Centenary of the birth of President Mandela and Nelson Mandela International Day, the Charge d’Affaires of Embassy of South Africa in Spain participated in the official launch of the following book: Nelson Mandela: a Checkers Player on Robben Island, a biography on Mandela written by Spanish journalist and academic Javier Fariñas Martín. The book focuses on the political history of South Africa but also on the personal story of Nelson Mandela, highlighting specific individuals that had a unique influence over his journey in life, from his childhood to his years as Head of State, and that played an important role in the events that finally made him who he was. 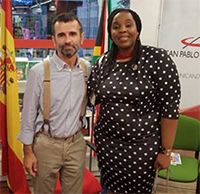 The event, which was held at the San Pablo Bookshop in central Madrid, was well attended by members of the diplomatic corps, the African diaspora in Spain and the media. During her presentation, the Charge d’Affaires expressed gratitude; on behalf of the Government of South Africa; to the author of the book and to the editorial for having honoured President Mandela in this way, thereby contributing to Madiba’s legacy. Several experts on Africa joined the Charge d’Affaires in offering presentations about President Mandela at the event, which was followed by a cocktail offered by the Mission. The cocktail was served by Carifood, an NGO that focuses on social integration and creates programmes that offer employment opportunities to people from disadvantaged backgrounds. This year, the Mission organized the Nelson Mandela Centenary Race, which took place on Sunday, 22 July 2018. 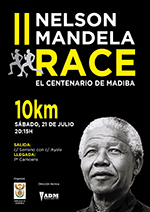 The Race, which covered 10 kilometres and included over 650 runners, was organized to pay tribute to President Mandela’s recognition of the value of sport in restoring the moral fabric of society and as a platform to promote reconciliation and unity throughout the world. This is the second year that the Mission has organized this popular marathon in Madrid. The Director General for Sports for the Madrid City Council, Mr. Javier Ordiozola, participated in the Race as well as the trophy award ceremony. The Deputy Director General for Sub-Saharan Africa in the Spanish Ministry of Foreign Affairs, the European Union and Cooperation, Mr. Alberto Cerezo, was also present at the trophy award ceremony which was presided over by the Head of Mission. Several handicapped members of the public participated in the Marathon. The event was made possible thanks to the sponsorship of several South African companies in Spain and Spanish companies with interests in South Africa, including Aspen Pharmacare, Cameto, Acerinox and Moneygram and the support of the Madrid City Council. 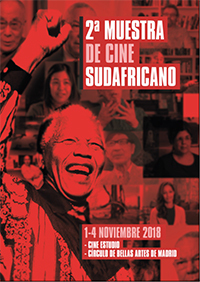 From 1 to 4 November 2018, the Mission in Madrid organized the Second South African Film Festival in Spain at the Estudio Cinema at the Madrid Fine Arts Centre, the prime location for international film festivals held in Madrid. The Festival was organized in conjunction with Ms. Mane Cisneros Manrique, Director of Spain’s annual African Film Festival and a Member of Casa Africa’s Advisory Board. Casa Africa is the institution that implements the Spanish Ministry of Foreign Affairs´ public diplomacy programme for Spain´s relations with Africa. As a tribute to the fact that, this year, the Mission was commemorating the centenary of the birth of President Nelson Mandela and of Ms. Albertina Sisulu, the Festival included a wide range of recent South Africa films focusing on issues relating to the lives of these two legends of the liberation struggle in South Africa. All the films were well attended with an average of about 80 people attending each session. Each projection was also followed by a debate about the issues raised in the film. The Mission in Madrid decided to host this Second South African Film Festival, following a successful first South African Film Festival organized by the Mission last year. The main aim was to expose the Spanish public to the best of the South Africa film industry as well as to deepen understanding and appreciation of South African culture in Spain. The South African Embassy in Madrid, in collaboration with the South African National Department of Arts and Culture, FCAT and the NFVF will host a South African Film Festival from 27-29 October 2017 at the Golem Cinema, Madrid. The event is organized as part of the ongoing centenary programmes in South Africa in honour of South Africa's late freedom fighter, Hon. Mr Reginald Oliver Tambo, and is aimed at contributing towards deepening the bilateral cultural cooperation between the film industries of Spain and South Africa ". Click here to view the full programme of the South African films to be shown during this Festival. Press statement on the launch of the South African Chamber of Commerce in Spain on 9 June 2016.